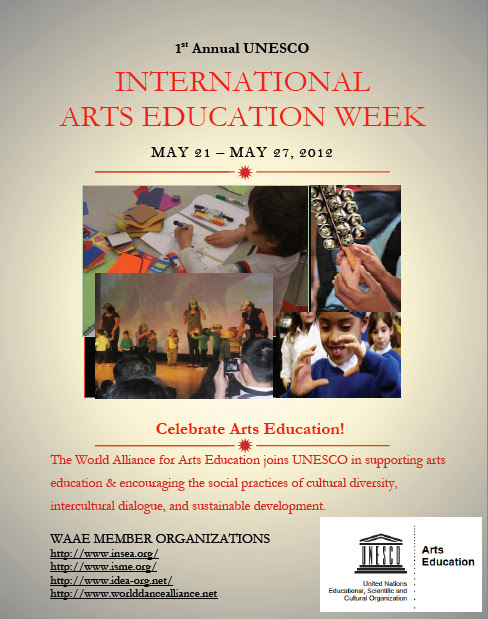 Following the success of the 2nd World Conference on Arts Education (25-28 May 2010, Seoul,), the 4th week of May has been proclaimed as International Arts Education Week by UNESCO’s General Conference at its 36th session. The main objective of the International Arts Education Week is to increase the international community’s awareness on the importance of arts education by showcasing concrete arts education projects and practices and reinforcing cooperation with main stakeholders of arts education. In order to ensure the success and global scope of the celebration of International Arts Education Week, indeed, all UNESCO partners and networks, as well as culture and education professionals, youth organizations, and intergovernmental organizations are invited to take part in the promotion of the International Arts Education Week. We would be grateful if you could consider contributing to this first celebration by highlighting the work that is being carried out, by informing local communities of this celebration and by organizing regionally or locally-based activities during this week. We would equally appreciate receiving information on planned activities and/or other communication materials that could be distributed during the event at UNESCO Headquarters. For further information, please contact Ms Sonia Nicolas (so.nicolas@unesco.org; +33 1 45 68 42 21). I thank you in advance for your kind cooperation and consideration.